You as I --have probably started an observation with -- if I live to be a hundred years old...and then we voice our lament. Well, if I live to be a hundred years old -- I will never ever understand how anyone can defend the cruelty of pig gestation crates. And yet Phil Borgic is one such owner who justifies the use of these gestation crates for his 6,000 animal breeding operation which produces 160,000 pigs per year. For me- that means that 6,000 pigs are suffering right now, and this is only one pig operation- albeit a very large one in Illinois. 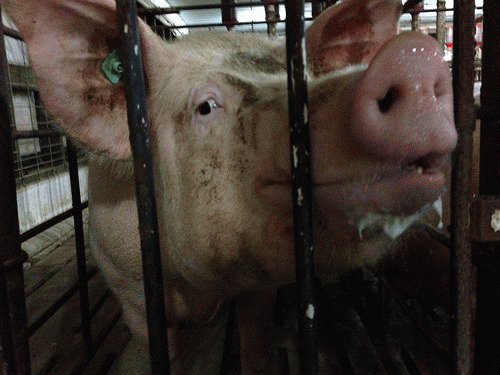 "For almost her entire life, iron bars will hold this mother pig on the slotted concrete floor of Borgic's 6,000 animal breeding operation as she produces litter after litter. She can step a few inches forward or backward but not turn around. Her heaving belly, swaying head and dark-rimmed eyes are the only parts she seems free to move." Torture-plain and simple. Even people who committed murder and other heinous crimes have a better life in our prison system then these mother pigs who have committed no crimes at all but who are incarcerated for their whole natural lives in metal prisons in order to satisfy people's desire for their flesh.